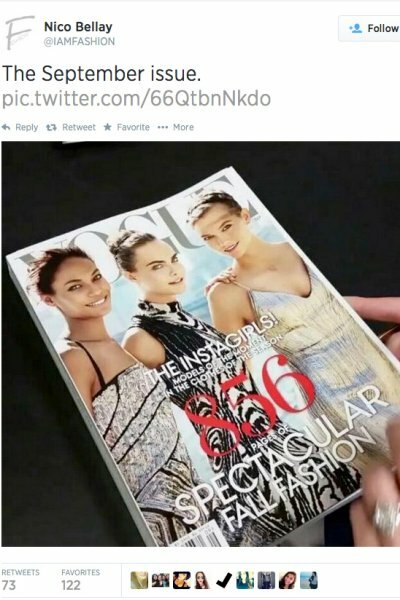 Was the Vogue September Issue leaked on twitter? Nico Bellay (@IAMFASHION) took took to twitter and leaked this image of what seems to be the infamous september issue. In lieu of the distaste from loyal Vogue readers recently for supporting the celebrity culture over fashion (Kimye cover), it seems as they might be trying to get back in our good graces. The cover in question features three of the most talked about supermodels of this past year: Joan Smalls, Cara Delevingne and Karlie Kloss. The cover reads “Instagirls: Models of the moment in the clothes of the season.” If you ask me, that title sounds a little more like something say Lucky Magazine would put out. It doesn’t have that classic Vogue allure, but we can look past that. The question here really is, is this the real cover? New York Magazine reached out to Vogue for a comment, but has yet to get anything in return. Could this be the resurgence the fashion industry has been waiting for? We have long swooned for the days when the models graced the covers instead of celebrities. Back when fashion was about glamour and making a statement, not what Kate Winslet likes to wear. I swore off American Vogue until a change was made. I’m really over how the fashion industry is helping to make stupid people famous (I think you all know who I’m talking about). There are alternative Vogues for those of us who support the old school idea of fashion, even with our more relaxed modern trends (Australian Vogue is my personal favorite). Like I said before, is Anna Wintour and her team trying to get back in our good graces? Or is someone out there just trying to stir up hype for next months fashion bible? If the latter is whats happening, let me say this now. I will not purchase the September issue if another celebrity is on the cover. My money will not go to a magazine that acts like a trendy People. But, If Anna chose to make a stand and put models back on her cover, well then I might just change my mind and reinstate my subscription. Who do you want to see on the cover? Sound off in the comments! Posted in Culture, Fashion, Uncategorized and tagged American Vogue, Anna Wintour, Cara Delevingne, Fashion, Joan Smalls, Karlie Kloss, Kimye, Leak, New York Magazine, Nico Bellay, September Issue Leak, Stupid People, Style, The Cut, The September Issue, Trends, Twitter, Vogue, Vogue Australia, Vogue US. Bookmark the permalink.